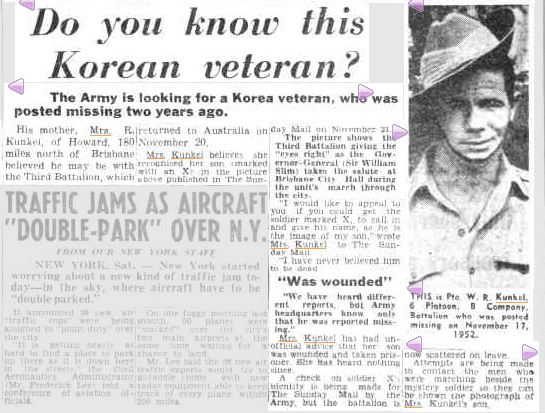 A few years back I wrote in detail about my father’s cousin, William Rudolph (Robert) Kunkel, who went missing in Korea. Dad always said that Robert’s parents never gave up hope of finding him. Like so many families whose sons went missing in action during battle, there must have been a sense of ambiguity and uncertainty…perhaps one day he’d turn up. Recently I was searching Trove and came up with another news story about Robert Kunkel. 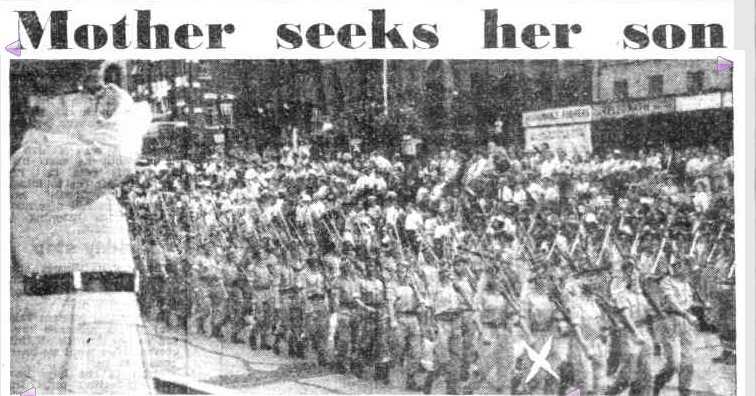 It was a very big entry on page 4 of Brisbane’s Sunday Mail on 12 December 1954[i]. Robert’s mother, Hilda, plainly believed that it was her son seen in the march-past at the City Hall of the 3rd Battalion, recently returned from Korea, even though he’d served with the 1st Battalion. As a child I always heard that Robert had never returned so it’s plain that the man marked didn’t turn out to be her son. What a sad loss it was for Robert’s parents, Hilda and Bill, who never stopped missing their son. I had hoped to hear from one of Robert’s mates after my previous post, but would still welcome contact from them or a descendant if they inherited a story about Robert’s capture by the North Koreans. The surviving men from the patrol were Corporal William Crotty, Brian Ransfield Mau from Hamilton, New Zealand and S Brent (Sidney Henry Brent?). Crotty and Kunkel were apparently good mates.